Life Happens- for reservations less then 30 days, we will credit your account the amount paid for future stays. Cancellations 30 or more days notice we will issue a credit to the method of payment, less any cc processing fees that we incur. RELEASE & WAIVEROF LIABILITY AND INDEMNITYAGREEMENT IN CONSIDERATION for being permittedto enter premises and property (area) owned by Robert Malkin and Barbara Pokrasand operated by A Stream SIde Cottage, LLC (SS ) Marjorie Juszczak, Melissa Juszczak for vacation rental or any other purpose,the undersigned (RELEASOR), for himself/herself, his/her personalrepresentatives, guests, children, heirs, invitees, and next of kin acknowledgesthat they are entering an area that is wooded that contains: wild animals,insects, cliffs, rocks, streams and other conditions that can be very hazardousand undertakes that he/she has or willimmediately upon entering, and will continuously thereafter inspect theimprovements and area. NO LIABILITY/INDEMNIFICATION/HOLDHARMLESS: Theundersigned hereby agrees to indemnify and hold harmless Malkin, Pokras and A Stream SIde Cottage, LLC, Marjorie Juszczak, Melissa Juszczak individually and together from any loss, liability, damages, or costs they may incurdue to their presence in or upon the area for any reason including negligenceor otherwise. The undersigned accepts full responsibility for all actions oftheir guests and invitees and further represents that they have full power andauthority to execute this release on behalf of themselves, their guests andinvitees(including any minors/children). : Malkin,Pokras and (WFH) shall have no liability for the loss,theft, damage or injury (or death) to persons or their personal property. THE UNDERSIGNED(releasor) herebycertifies that he/she and guests (they) have adequate insurance(and will solelyrely upon such coverage) to cover any injury, illness or damage that may becaused or suffered while in or upon area, or else agrees to bear the costs ofsuch damage or injury. The undersigned further that he/she/they have no medicalconditions which would interfere with or put them at risk for use of hot tub,swimming, canoeing, boating, hiking, rock climbing, climbing stairs, etc. orelse assume and bear the costs of all risks that may be created, directly orindirectly, by any such condition and expressly acknowledges such physicalactivities are dangerous and involve the risk of serious injury and/or deathand/or property damage. The undersigned further expressly agrees that theforegoing release, waiver and indemnity agreement is intended to be as broadand inclusive as is permitted by law and that if any provision is held invalid,it is agreed that the balance shall, notwithstanding, continue in full legalforce and effect. MEDIATION AND ARBITRATION: theparties agree mediate any dispute or claim arising out of this Agreement, orany resulting transaction, before resorting to arbitration. Mediation fees, ifany, shall be divided equally among the parties involved. In the event thatarbitration is required, renter agrees that individual arbitration before asingle arbiter shall then be the sole venue for dispute resolution. The venueshall be the American Arbitration Association at its offices that are theclosest geographically to Albany, New York and the laws of the State of NewYork shall be applied. The undersigned (releasor) has readthis document and acknowledges that Malkin, Pokras and Stream SIde (SS)have relied uponthe representations and agreements contained herein and would not have allowedor permitted the releasor, guests and invitees onto the premises without theserepresentations and agreements being understood and agreed to. 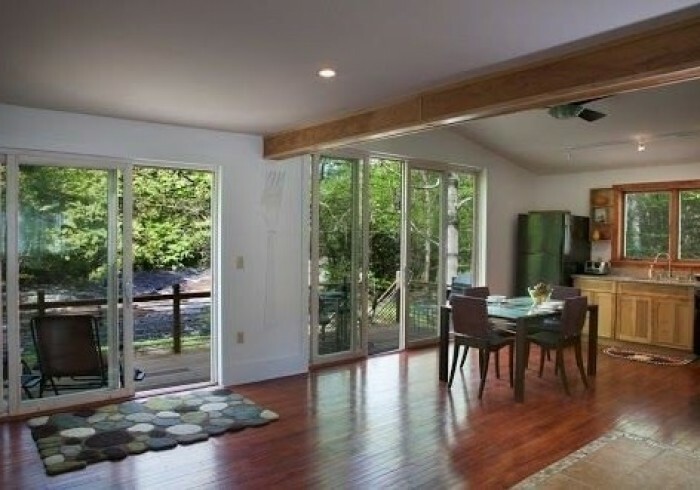 Nestled in the foothills of the Catskills with your own private 1000' of stream frontage and paths to a waterfall. A Stream Side Cottage is the perfect choice for that weekend getaway, family vacation, ladies weekend or romantic holiday. A Stream Side Cottage is ideally located with easy access to Woodstock, Saugerties, Hunter Mountain and H.I.T.S. ( for seasonal equestrian events) and a mere two hour drive from the George Washington Bridge. Soak in our charming, claw foot tub and take in the water view after a day of hiking, golf, tennis, swimming, fishing, skiing and allow the stresses of everyday life to vanish. Enjoy the warmth of our cast iron gas fireplace. Have a glass of wine on the wide deck overlooking the water, or walk the hiking trails both on property and on the country lane. Too lazy to move? Stretch out on our stream side hammock and fall asleep to the soothing sounds of water. ​Guests at A Stream Side Cottage can enjoy kayaking at A Tiny House Resort- Plus Spring 2018 a new heated lap pool, imagine a swim while overlooking the stream.